Your tickets will be delivered to the billing address you provide; most tickets are shipped via Federal Express. 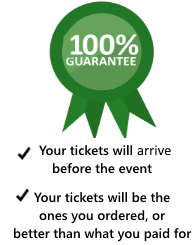 We guarantee that the tickets will be shipped to you in sufficient time so that at least one delivery attempt will be made before the event occurs. If you do not receive the exact tickets you ordered, Let's Play Ball Tickets guarantees that replacement tickets will be of equal or greater value than the tickets originally requested. Unless otherwise noted as part of the ticket description, any tickets you buy from Let's Play Ball Tickets are guaranteed to be authentic tickets, valid for entry to the event. If you are denied admission by the venue, Let's Play Ball Tickets will investigate the incident and will refund the full cost of tickets, including shipping and service fees, if we find that the mistake was ours. If event is permanently canceled, Let's Play Ball Tickets will coordinate with the selling broker to provide you with a full refund of the ticket price, including any service fees.